« Zabaglione with a heaping tbsp of THANKS! What’s with all the lies? No, it’s more than just a lie, it’s a conspiracy. Parents pass it on to their kids, who in turn pass it on to their little ones, who just don’t know any better. The lies stop here my friends. I am nipping this one in the bud: when life supposedly hands you your lemons, don’t make lemonade. Instead, make some حامض مرقد. Keep reading; it’s a lot easier than it sounds (if you could sound that out). In English, حامض مرقد, sounds something like ha-moud ma-rak-ad; which literally means sleeping lemons in Arabic. Before you call me crazy (and probably go make yourself another batch of lemonade) I’d like to remind you of the fable of the ant and the grasshopper. The classic fable tells the story of a lazy grasshopper who spends his summer singing away while a dedicated little ant works hard to gather food for the upcoming brutal winter. When winter strikes, the grasshopper ends up hungry and begs his tiny friend to share some of his food. The moral of this fable lends itself perfectly to my humble post on this Moroccan staple. See, in Morocco, it’s traditional to preserve lemons in order to use them later in tagines, soups, stews… pretty much anything that you want to give flavor to. Since I love making all these hearty dishes in the winter, I make my hamoud m’rakad now, as in 3 months before winter hits. This stuff lasts forever (i.e. 6-8 months) and the process couldn’t be easier. All it is are lemons that have been packed with salt and stuffed into an airtight jar. Seriously, that’s it. When you’re ready to use the lemons; take out a piece, rinse off the excess salt, and finely chop it into whatever you’re cooking up that evening. The flavor it imparts brings a unique citrusy component to the dish. It’s lemony, and tart and perfect in every single way. So, next time you’re going to make some lemonade, set a few lemons aside to make a jar of حامض مرقد you won’t regret it! Barely slice off both ends so that only the pith is showing (not the flesh). 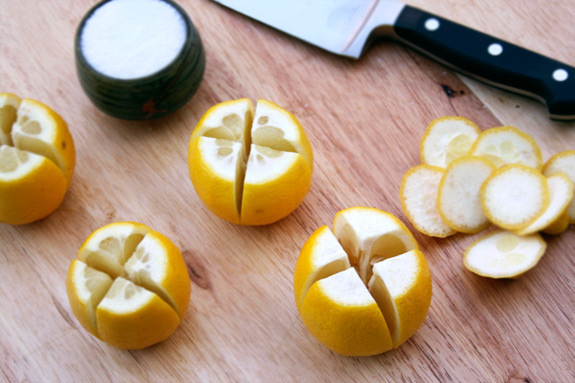 Slice the lemon horizontally and vertically making sure not to reach all the way to the bottom. The lemon will resemble a flower at this point. 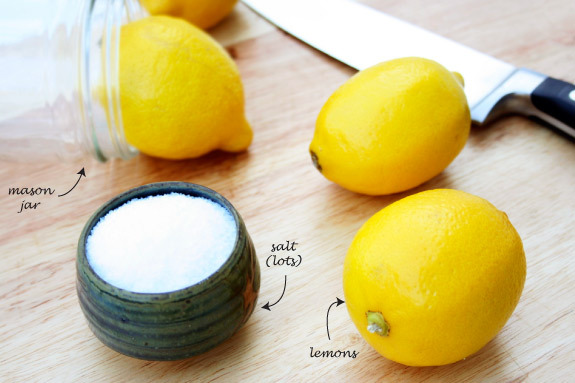 Sprinkle a little salt at the bottom of the jar and then stuff each lemon with the rest. If there is any leftover salt, you can pour it on top. Strategically fit as many lemons as possible into the jar and make sure the lemons are covered with juice to prevent spoilage. You may want to add extra lemon juice if the lemons you used haven’t given off enough juice. Store in a cool dark place for 6-8 weeks (in warm weather, you may want to store it in the fridge). 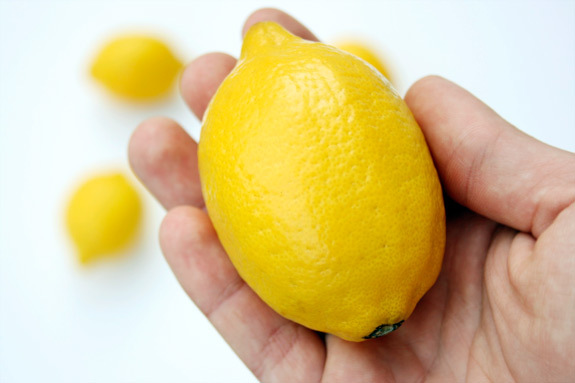 To use, rinse lemon wedge(s) in water to remove excess salt. Discard the flesh and chop the rind finely into the dish. notes: Use the smallest lemons you can find for this dish. The liquid will be cloudy at first, but it will clear up by the 5th or 6th week. You’ll know that the lemons are ready to use once the pith has lost its white color. You can also add different flavors to your preserved lemons by adding peppercorns, whole cloves, whole coriander seeds, or bay leaves to the jar (try to add any spices closer to the sides of the jar so you can identify the spices by looking at the jar weeks later). Posted in appetizers, North African, recipe, savory by Antonio Tahhan on August 13th, 2008. You can follow any responses to this entry through the RSS 2.0 feed. You can leave a response, or trackback from your own site. How cool is this?! I never knew about preserving lemons before! Thanks for teaching me something new! While I’ve never had preserved lemons before, I keep on hearing about them and now I’m so curious! Maybe I’ll give them a shot next time I come into a surplus of lemons. That’s pretty much the easiest thing to do, and it adds a great flavor to recipes. And it’s lemon! I need to get some lemons tomorrow! I love all things lemon, Tony, but have never tried this. It looks so wonderful I’m sure I’d love it too! You don’t have to use a sterilized jar? I’ve read several versions of this, and *one* of them uses a sterilized jar, which has stumped me. This is so great. I am always looking for preserved lemons at gourmet shops. Now, I can make them. Thank you! Christina – yup! it’s super easy and lemons are one of my faves, too! Jaden – yay! spread the lemon love 🙂 I can’t wait to use them this winter and to see what delicious things you do with your lemons! Patricia – oh, you’ve gotta try this one! Preserving the lemon literally packs in all the lemony goodness into one jar. Sasha – no worries… the reason why you want to sterilize jars for things such as jams is because the jam (and all other sweet goodies) is conducive to bacteria growth. Whereas with these salt-packed lemons, as long as you have all your lemons completely submerged in the salt-heavy lemon juice, bacteria won’t want to grow there 🙂 That’s how they keep prosciutto from rotting, too 🙂 I hope this helps! I had preserved limes at an Indian restaurant once, is this the same process? I obviously need to get some lemons stat! It’s so weird, I just made a dish the other day that called for preserved lemons, something I’ve been wanting to make for quite some time but haven’t gotten around to it. So I was kicking myself when I read that recipe and had to use fresh lemons. Add to that, my lemon tree, which is ready to burst! This is kismet, I tell you! Thanks for the great post and a kick in the right direction. 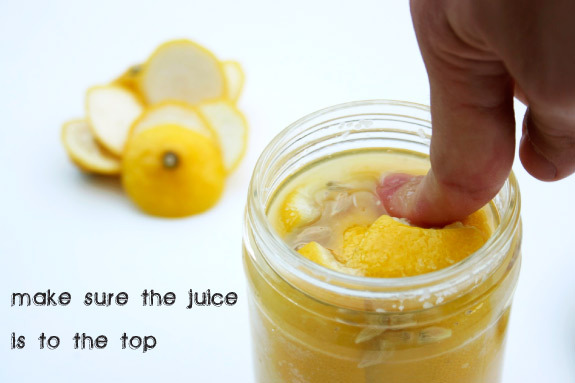 We love preserved lemon and always keep a jar on hand in the fridge. Your version looks good. We also really like Jamie Oliver’s version which is spiced up with a lot of Middle Eastern herbs and spices. Also, we think the Meyer Lemon, when available, makes an interesting variation. Seriously? It’s really that easy! I’m doing this ASAP! I love lemons, what better way to keep them on hand all winter long than to preserve them.. Smokin’! could you use lime as well, do you know if the outcome would be as useful? Wonderful recipe! I have always wanted to do this, but have never tried. Your recipe is so simple. Thank you! Great, but if you can get lemons anytime you want them why the need to preserve? Preserved lemons are a staple in Moroccan cuisine. I made a Moroccan meal a while ago, which began several months before with preserving lemons. You have to taste them to experience them; they really taste like nothing else, including fresh lemons. You use the entire lemon, peel and all, in Morrocan tagines. Preserving the lemon makes the rind quite soft. The texture is more like cooked summer squash than anything else. So yes: preserve some lemons! But don’t try to use the preserved lemons the same way you would use fresh lemons. Conversely, when a recipe calls for preserved lemon, don’t use fresh lemon, since the two tastes are very, very different. Thanks, and I’m going to RSS your blog so I can continue to check out your new recipes! why did you start this off by talking about lies? a little misplaced. Thank you for your comments on my website, http://www.kittymorse.com, re: preserved lemons. As you know, they are an essential Moroccan condiment, good with fish, lamb, vegetables, and anything else lemony your heart desires. I give many different recipes in my cookbooks, Cooking at the Kasbah: Recipes from my Moroccan Kitchen, and the Scent of Orange Blossoms: Sephardic Cuisine from Morocco. I am glad to hear you are an aficionado of Moroccan cuisine! PS: What a fun blog you have..
I’ve had this once before and it is absolutely amazing! It’s very simple to make and I sttrongly recommend doing so. Thanks for the recipe, but you don’t call for nearly enough lemon juice. I packed four lemons into a small jar and needed the juice of an additional six lemons to top it off. When I made this in the past with a similar recipe, I used some organic lemon juice from Trader Joe’s to top off the lemons. It worked great, and as your commentary says, there’s nothing quite like the taste of preserved lemons (especially paired with green olives and roast chicken) to brighten a winter’s day. Anyway, great recipe. Just not enough lemon juice. I have just started to make Moroccan food and I saw that it called for preserved lemons. I had no clue what that was until now. Does it taste different than regular lemon juice? what a coincidence, my mom just taught me this method a few days ago!! i recommend SEA SALT instead of salt…. after you wait the 3-6 months (or longer), you can use the sea salted lemon to cure colds and sore throats, salt=cleans away the bacteria, lemon=vitamin c. just cut a piece off and add hot water. Is it possible to use vinegar instead of salt? 1. why on Earth would I waste time on this when I can buy fresh lemons any time of the year? Or does this taste better than fresh lemons? 2. why kosher salt? what’s wrong with regular salt? do you think that Moroccans use kosher salt? Erm, messenger – try reading the post and comments. Re 1: To repeat, preserved lemons taste nothing like fresh ones, and they are used in a completely different way (ie: no juice, as with fresh lemons; you get rid of the pulp and use the preserved peel, usually finely cut up). Google some Moroccan recipes and educate yourself. Re 2: Stupid question. Obviously the blog author is Jewish, so he chooses to use kosher salt. Use whatever salt you like. Like, duh! I’ve just preserved a batch of lemons, they’re great!